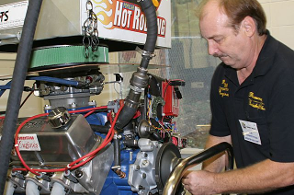 Get EXACTLY What's Needed For Your Domestic Engine - "The First Time"
ALL are "custom" camshaft grinds to particular specificications for THAT particular individual application, where blank cores are available. be aware that the EDM oiling face lifters will be over $220.00 from here; I will recomend "Howard's". Payment for custom ground camshafts must made in advance by cashiers check or U.S. Postal money order. Custom "Street Rod" Series type camshafts NOW available ... ! Get That "choppier" idle yet retain all drivability from just "off-idle" on up. The specific specifications are different for EVERY application. All aplications are special. Exactly what you are probably in search of having. These camshafts are meant for that special SOUND; with great cruising drivability, too. GOOD power production from an everyday "street rod" camshaft. After rigorous ongoing testing and several attempts we have zero'd in on exactly what is needed for either 302 or 351W engines to substantially increase horsepower AND milage with NO ill effects to drivability what-so-ever and still use all production hardware including the stock ECM. Three different spec grinds available. Using several DAKOTA pickups having both 318 Magnum & 360 Magnum engines, the same type testing was done with great success shown in power output with NO ill effects to drivability what-so-ever and still use all production hardware including the engine computor module. These are no longer available with new FMC core so, price is no longer valid unless we re-grind your factory hydraulic roller camshaft. 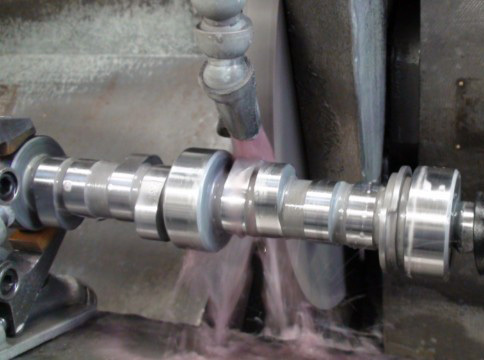 We provide custom ground camshafts for most any common high performance engine ...... If a core is available to us; it can be ground. S.B. Ford STREET TURBO HYDRAULIC ROLLER CAMS ... $259.45 (at this price, available as a re-grind only; exchange) $339.77 price when using with a new cam core. For small block Ford engines. We tested numorous camshafts in a street Mustang 331 cubic inch engine using OEM cylinder heads with 8 pounds of intake boost. We settled on a specific grind which we now offer to the street Turbocharger enthusiests. 270/268 @.006" - 219/215 @.050" - 137/134 @.200" - .323"/.326" LOBE lift - .517"/.522" valve lift; (with 1.6/1 OEM rocker arm ratio) - 115 degree separation. Stock on hand has been sold out however, this can still be gotten new; special order. The Big Block Ford Saga ... ! Camshaft companies list in their catalog mostly B.B Chevrolet profile camgrinds for their Big Block Ford catalog listings simply because they haven't really designed and tested anything using a 429/460 Ford engine. Simply stated, their thought is, IF the two brand engines look sort of similar in design to them, they MUST run alike when it comes to the camshaft requirements. They are NOT EVEN CLOSE to having the same requirements. To those companies ... it is simply GOOD ENOUGH to be adequate. These are dedicated "Custom" camshaft grinds for a Big Block Ford engine, epecially when the newest cylinder head offerings for the Big Block Ford engine are considered which WILL create abundantly more power. We especially have the Big Block Ford expertise and testing experience to get you the correct camshaft to perform the best with your cylinder head choice in your Big Block Ford powered vehicle.